At first sight you may not like the look or sound of a green smoothie, and I totally get it as they often conjure up images of lots of dark green bitter veggies like kale and cabbage, or foul tasting green powders such as spirulina and chlorella. But, you can make these smoothies taste awesome with a little imagination. Yes, they still contain all those nutritious greens but you’ll never know they’re in there… I promise. 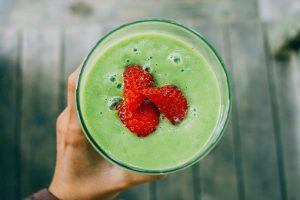 In this post I will show you how green smoothies and weight loss go hand in hand to bring you great fat burning results. Oh, and did I mention, they taste good too! Personally, I love a green smoothie and have at least one a day as either a snack, or even a complete meal. Yes, if you add the right ingredients they can become a low calorie, highly nutrient dense meal in themselves that will fill you up for hours. And this is why they are just SO great on a weight loss diet, because there is no time consuming cooking involved, you simply chop and chuck all the ingredients into a blender and voila – lunch! How Green Smoothies Boost Weight Loss! THEY’RE FULL OF FIBER – Which keeps you fuller for longer. 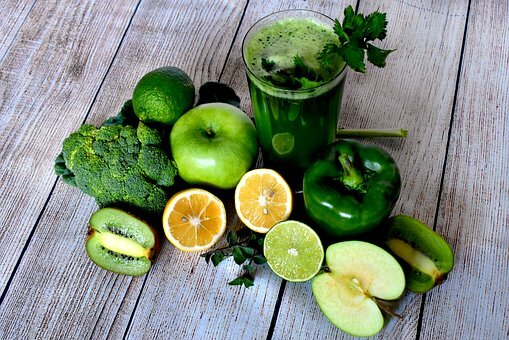 Unlike juicing you are blending the WHOLE fruits and vegetables and not extracting the fibers like you do when using a masticating juicer. This is what makes a smoothie much lower GI and more filling than a juice, because fiber keeps you full. THEY KEEP YOU FULL – Due to their high fiber content, a smoothie will help fill you up and stop cravings for junk foods. HIGH IN NUTRIENTS –The high nutrient content of a green smoothie helps to stop food cravings as your body will be receiving all the nutrients it needs to be satisfied. ANTIOXIDANTS – The antioxidants in green vegetables not only boost weight loss, but are highly anti aging and will literally make your skin glow. 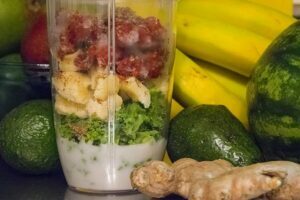 RAW ENZYMES – Blending fruits and vegetables in their raw state keeps all their enzymes, vitamins, and minerals in tact. Cooking foods can often destroy delicate nutrients, therefore eating as many raw foods as possible is a fantastic health boost. 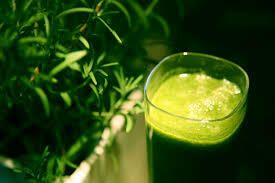 DETOXIFICATION – Raw greens, along with all their fibers and antioxidants are powerful detoxifyers. Keeping your body detoxifying itself adequately means your fat cells will start shrinking, ultimately leading to weight loss. This is because harmful toxins that your body can’t break down will be stored for safe keeping in your fat cells, which will then keep swelling larger and larger the more the body keeps getting bombarded with junk foods, sugar, tobacco, alcohol, and other environmental toxins – and you get larger with it! The great thing about a smoothie is you can have it any time of day, although maybe not so much in the evening if you are adding superfood powders as they can be stimulating. Other than that, in terms of weight loss you should have 2-3 a day in place of your normal meals or snacks. There are different ways you can construct a smoothie, and some will have more calories and be more filling than others. This makes some of them better as snacks and others better as meal replacements. Basically, you will want your smoothie to have the 3 main macro nutrient elements of HEALTHY FATS, CARBOHYDRATES, AND PROTEIN; plus FRUITS and VEGETABLES. Having these 3 elements will ensure that you are getting a filling and ‘complete’ meal or snack. But be sure to keep to your portions under control (especially the fats) if you want to lose weight. Pick one each from the protein, carbohydrates, and fats, and unlimited from the vegetables and low sugar fruits. Blitz together in your blender and enjoy. TIP:- Frozen sliced bananas and frozen fruits in general work best, as they will not only make your smoothie nice and cold but add a frothy, gooey milkshake texture too. FAT BURNING – Avocados help burn belly fat SPECIFICALLY! Yes they really do, and one reason for this is they help keep your blood sugar stable all day. 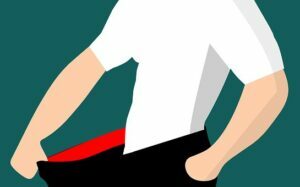 It is the fluctuations in blood sugar that causes your insulin to spike higher than it should, which then promotes belly fat storage – therefore stable blood sugar means extra belly fat burning. The second reason is they contain high levels of oleic fatty acids, which were shown in this Penn State study to lower belly fat by 1.6% when eaten at equivalent of 3 tablespoons a day instead of other fats. Awesome huh? HIGH IN MONOUNSATURATED FATS – Avocados are high in the fats that will keep your heart super healthy and strong, thus lowering your risk of heart disease. LOW GI – Low GI foods help to keep your blood sugar on an even keel, which in turn helps to bust sugar cravings. Ending the continual cycle of the sugar train is your ultimate goal as this will also help keep you slim for life. HEALTHY FATS – Not only are the avocado’s fats good for your heart, but eating some kind of fat with your greens – be it avocado, coconut oil, nuts, or seeds is essential for the uptake of the fat soluble nutrients A, E, and K in your green vegetables and your green superfood powders. There’s no point in going to all this green eating effort in the first place if you’re not absorbing all the nutrients. 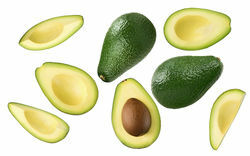 FILLING – Lastly, avocados, due to their high fiber and stabalising effect on blood sugar, realy do fill you up good and proper. In fact, studies show that those who ate the equivalent of one avocado a day (as high calorie as they may be) still ate FEWER calories overall throughout the day. This really works! I’ve tested it myself many times and they really do actually fill you up for hours. You should be having at least one shot of green superfood powder a day, just for the simple fact that they are bursting with life giving nutrition; and those nutrients can get into your cells fast, giving you a noticeable boost of energy within 20-30 minutes! They are also a metabolism boosting food that will help you burn belly fat over time. You can choose from spirulina, barley grass, chlorella, or moringa, or simply buy a blend of all of them. This is much more preferable as you will get a good array of the key nutrients from all of them. DETOXIFICATION – Keeping your body detoxifying well is one of the key elements in long term weight loss. The more toxins you can eliminate the more your fat cells will shrink. This only works alongside a general antioxidant rich healthy diet; you just can’t eat junk and expect the same results. ANTI AGING – Green superfood is so high in antioxidants that it will literally make your skin glow, and can slow down or in some cases even REVERSE the aging process on both the inside and out. ANTI INFLAMMATORY – As green superfood is highly alkaline, it helps to lower chronic inflammation in the body. Long term chronic inflammation is now thought to be among one of the root causes underpinning many modern day diseases. This inflammation can be caused by such things that include under par detoxification, junk foods, SUGAR, smoking, alcohol; and also the barrage of environmental toxins that we are all exposed to on a daily basis. BLOOD PRESSURE – Green superfood powders, when used alongside a low saturated fat diet, may also help to lower blood pressure when used daily and over time. SLEEP – I don’t know why, but green superfood when taken daily definitely helps you get a good night’s kip. I have seen this in myself and in also in others whom have reviewed it. It’s probably more than likely due to a combination of its super high antioxidant content, and also its effects on lowering blood sugar. You always sleep better when your blood sugar is under control as any spikes and troughs can wake you. LOWER BLOOD SUGAR – Which means fewer cravings and sugar spikes, therefore weight loss. Green superfood powder is also a great supplement (alongside diet control) for diabetics for this very reason. STRONGER IMMUNE SYSTEM – Green superfood powder may help to neutralise the free radicals that harm your immune cells, allowing them to flourish and become stronger. Adding superfoods to your smoothies is a must if you really want to cut fat and take your health to another level. There are many to choose from, and they all have different nutrient profiles. I advise to rotate or mix at least 2 or 3 – or ideally buy a blend. Always go for organic to ensure purity of the product. Please read my ultimate green superfood powder guide before you buy, and to be sure you get something that will work for you and your needs. Protein powders are just so easy to take, and ideal to use in a smoothie. They help you obtain your protein needs (especially on a plant based or vegan diet) and they also keep your muscle mass high, which can be another quite challenging thing to do when you’re cutting calories. MUSCLE MASS – The more muscle you can keep a hold of whilst dieting, the more calories you will burn, because muscle in itself is a calorie burner. Protein powders are excellent at helping you maintain your requirements without too many extra calories. WEIGHT LOSS – A high protein diet will automatically help boost weight loss mainly due to the fact that you will be filling up on protein rather than carbohydrates, and also because protein is thermogenic – meaning it boosts metabolism. Plus it’s filling too! LOW GLYCEMIC INDEX – Protein has a low GI, which is yet another weight loss advantage as it will help to keep your blood sugar stable and as explained previously, this too helps with weight loss. COMPLETE MEAL – Many of the protein powders available come with added enzymes, nutrients, fiber, greens, even probiotics, all of which can make them a complete meal in themselves, OR great added to your smoothie to bulk it out and make it more filling. Every morning I have a low carb chocolate protein pudding (it’s basically a really thick smoothie) and it’s absolutely delicious, in fact I can’t wait to get up and make it it’s that good! Use 30 grams of protein powder (that is 30 grams total protein). This will usually work out more in actual weight as most protein powders are around 50% protein, therefore you would need 60 grams of the powder to get 30 grams of protein. Blend this with half an avocado, xylitol for sweetness (if the protein doesn’t have added sweeteners), a tablespoon of carob or cacao, and some nut milk. The secret is to use a good quality blender for smoothness, and use as little milk as possible so it’s really thick like a pudding, then just eat it straight out of the blender cup. I think smoothies are more filling the thicker they are, and this one fills me up for at least 4 hours. The reason I do this every day, is that having a very low carb/high protein breakfast really keeps your body in fat burning mode after you have been fasting all night. I then just have a normal lunch and dinner, and sometimes another high protein smoothie if I do a hard workout. Detoxifiying smoothies will help keep your body in a high state of detoxification, which ultimately will help boost weight loss, get your skin glowing, give you high levels of energy, and most importantly give you a strong immune system, meaning less chance of catching bugs and viruses. Plant Based Protein is Best! Whether you’re a plant based eater or not, vegan protein powders are the best way to go as they are ‘cleaner’ protein and cause less inflammation in your body than their whey or dairy counterparts. This means less muscle aches after exercise and quicker recovery (yes, I’ve tried and tested this). There are many plant based protein powders on the market such as pea, rice, potato, hemp, sunflower, quinoa, pumpkin, almond, and many more. It seems they are making protein powders out of everything these days to keep up with the demand of the plant based diet explosion. What Protein Powder Should I Choose? Here’s the tricky bit: some plant proteins don’t have all the amino acids of animal proteins; or they may be higher in some and lower in others. This is by no means a problem though because their benefits are higher in other ways, you just need to be sure you either buy one that is either already a complete protein; OR buy a couple and mix them up or rotate them; or much more conveniently, buy a blend. Manufacturers of the blends have already mixed them up into their perfect amino acid ratios, and have often added other nutrients into the bargain. As well as your green smoothies, you should stick to a highly plant based diet with lots of fresh fruits, vegetables, legumes, nuts and seeds as this will help to boost weight loss and antioxidants even more. If you still want to eat animal products then eat them in smaller portions and load up on all the other plant goodies. Thank you for visiting zestforever today! If you would like to ask any questions about the plant based diet or comments about green smoothies, then please drop me a line below as I am always happy to hear from you. I love having smoothies in the morning for breakfast. Fast and simple, also its hard to make a bad one when trying something new! Hi, glad you like a smoothie! They really are a healthy and low calorie way to start your day and I love the fact you can literally use any ingredients you have in your fridge. They all taste good as long as there’s some sweetness in there from some fruits. Your post is as jammed packed as the smoothies you write about. We normally have a fruit smoothie around lunch time and have only on occasion tried the green stuff (we don’t keep at it because of the taste). I noted the recipes you suggested here and will give them a try. I was intrigued by the information you provide on avocados. We live in Nicaragua and have a bunch of avocado trees on our property. I eat lots of them as a side dish with meals when they are in season but never thought of using them in a smoothie. When they come around again, I’ll have to try it out (likely tastes better than cold avocado soup). Hi there, wow, you don’t know how much I’d absolutely love to have an avocado tree in my garden. This just seems like a far off dream considering I live in a flat in England (not sure it’s even possible to grow avocados in this climate). Putting avocado in your smoothies will rock your world and I can’t believe you haven’t tried it! ha ha. Make sure they are really nice ripe and creamy ones and they will give your smoothie a texture of silk. Seriously, everything tastes better with the addition of fats as they carry flavour, and avocados have some seriously good fats. I hope you enjoy my suggestion. 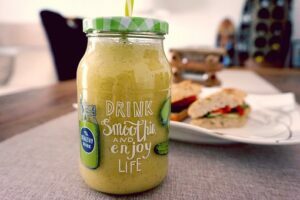 I do love smoothies, and you have some great ideas for putting together some delicious ones. I have just spent a month visiting my dad in Alaska. I always gain weight when I visit him. Problem is I leave for a cruise in 3 weeks so I will be working over time to get back into shape before I leave. I am going to give these a try as I am sure they will help speed up the weight loss process. Thanks! Hey, I’m pretty envious about the cruise, sounds great! I reckon if you replaced your breakfast and lunch with a green smoothie then had a low calorie dinner you could easily drop half a stone before your cruise and look fantastic. Remember to make your morning one very HIGH protein, but LOW carb. This will really get your body burning fat and boost your metabolism. Good luck, and I’d love to know how you get on. Thank you so much for clearly laying out everything that’s good for you and why you should be putting greens in your smoothies. You have definitely reminded me that I have some spinach in the fridge that needs to be consumed and I will be putting it in my morning smoothie tomorrow actually. I used to juice all of the time and I really enjoyed it but yes, after a while I found that I wasn’t feeling as full and I really wanted to get all of the nutrients out of the fruits and veggies I was consuming. Hi Kahlua, spinach is actually one of my favorite greens to put into a smoothie; not only is it full of iron but it also blends up really well and doesn’t have a bitter taste like some greens do. Yes, juices don’t fill you up as much as there is no fiber in there. In fact, unless you’re just juicing pure greens then they can actually have a high GI which isn’t that good if you are trying to lose weight. That’s why I advocate the green smoothie instead for weight loss purposes. I hope you enjoy your green smoothie tomorrow morning. You should totally try the avocado, banana, and spinach one as it is just SO tasty and one of my all time favorites. I love green smoothies and have been making them for years. They are such a healthy treat. Actually, I never thought about replacing a meal with a green smoothie. I am trying to loose a few pounds, so I will definitely start doing this. Do I still need a salad with greens after having a green smoothie? I have been struggling with this for awhile. Hi Carol, that’s great you regularly have a green smoothie! And yes, I often always have a very high protein one for breakfast every single day and then often have one as an afternoon or post workout snack too.They really give you a boost, and the more greens the better. I would say that if you’re not enjoying salad that much then you don’t need to worry too much if you are having at least one smoothie a day. You probably should get some other maybe lightly steamed veggies in with your main meal to be sure you are keeping things mixed up and getting a good array of nutrients. I haven’t tried avocado in my smoothie, great idea! And I do need to do this for a few days. I love your blog, it’s seriously great to feel better and you have some ideas to get healthy. Keep it up! Hi Brian, I’m actually quite surprised how many people have said they haven’t tried avocado in their smoothies. It’s just the best and really makes them creamy and smooth like a milkshake. I love it, plus they are super healthy! Please give it a go and let me know your thoughts. I am interested in more green smoothie recipes. I only have 10 pounds to lose, though. It shouldn’t be that hard to lose 10 pounds. I believe 1 pound a week is pretty doable. However, which juicer do you recommend mine has quit working. I had it for 4 years and the motor completely burnt out last night. Also, have you ever heard of powdered peanut butter? I haven’t ever tried it, but was thinking about trying it. Do you think it’s more healthy? I saw the recipe with protein powder, soya milk, and sugar-free peanut butter. Hi Garen, yes I use powdered peanut butter, I have just discovered it and it’s called PBFIT! What a great invention it is as it tastes delicious without the fat, it’s my new favorite food haha. You just have to be sure to buy the plain one as I made the mistake of buying the chocolate one and not only is it much lower in protein but it also has added sugar, so no benefits there. I’ve been adding it to my protein shakes, porridge, and also just mixing it with water and using it on toast like I would with normal peanut butter. Congratulations on only having 10 lbs to lose, sounds like you have been working hard. I myself use either a nutri bullet or nutri ninja for my smoothies. A juicer is a different thing as it literally just juices and takes out all the fiber, where as a blender you just put the whole fruit and veg in and it blends it with all the fibers, making it much thicker with no wastage. This is my preferred method as I find them much more filling, therefore better for weight loss. I really love smoothies and have one almost every morning. I usually make it with banana, but also like your idea to make it with avocado. 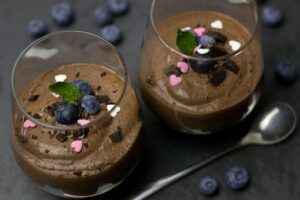 The chocolate protein pudding also looks delicious, cannot wait to try it. What is your No.1 recommendation for plant protein powder when it comes to weight loss? Hi Blanka, that’s great you have a healthy smoothie every morning. You so need to try it with avocado as it just makes it so creamy and delicious! When it comes to weight loss I would go for higher fiber protein powders, hemp and pumpkin seem to be good for this but I’m sure there are others if you check the labels. This is good because fiber keeps you full but has NO calories, how great is that? So the higher fiber the better! Another good read! I agree that vegan protein powders are better than whey protein powders! They seem to digest better and not make me as bloated, so I can carry on with a busy day! I’ve rarely made my own smoothies or protein shakes but I now have more knowledge in how to go about it, thank you! Hi Nick, yes I used to get bloated on whey protein back when I used to eat dairy, in fact, I can’t tolerate dairy at all which I finally realised after I went fully plant based. I no longer ever get bloated on this way of eating and it has changed my life, hence the reason for this website. Smoothies are particularly good for weight loss as they have all their fibers still in them so they fill you up. You should definitely have a go at making your own.